Hoping for a baby Smith: A New Appointment! oh and P.S. 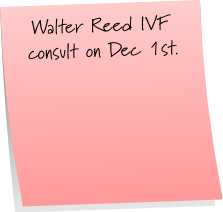 This is a real reminder note as we have our first DR app at Walter Reed Scheduled.